You may have heard about a new frontier in tattooing: eyeball tattoos. A quick internet search will turn up dozens of photos (some real, some fake) of people with black, blue or multi-colored eyes. But just because some people have gotten away with it, don’t assume it’s safe—or a good idea. Your ophthalmologist says the risks aren’t worth it. Paul Freund, MD, and Mark Greve, MD, from the University of Alberta in Canada recently reported on a tragic case. A 24-year-old man underwent an eyeball tattoo procedure and experienced a sudden, painful loss of vision while the tattoo artist was injecting ink into the first eye. 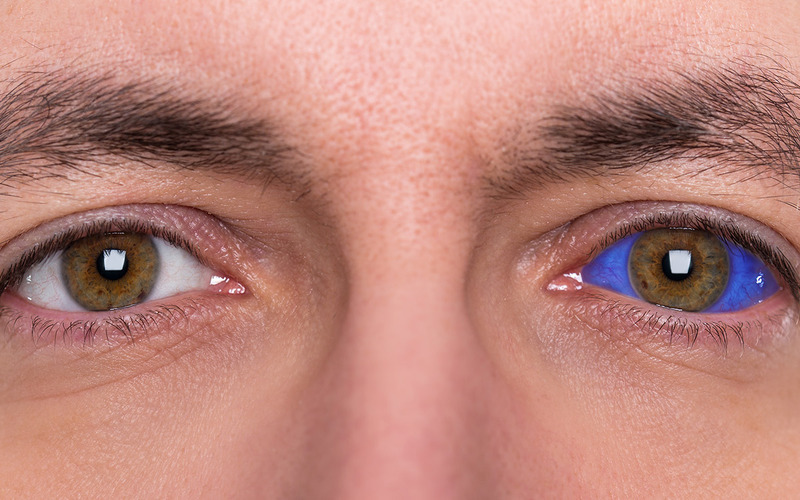 For eye tattoos, the tattooist injects ink just under the surface of the conjunctiva, so it colors the sclera – the white part of the eye. In this case, the ink had been injected too deep, into the vitreous humor in the middle of the eye. A still from surgical video of the procedure to remove the vitreous and tattoo ink inside the patient’s eye. The patient sought treatment three days after the tattoo procedure. Drs. Freund and Greve removed the vitreous and the lens of the eye. The lens had been damaged by the needle during the tattoo procedure. The doctors discovered that the mixture of vitreous and tattoo ink was contaminated with bacteria. Two surgeries and multiple procedures to deliver antibiotics were done to try to control the infection and complications from the tattoo procedure. Eventually, the entire eye had to be removed because the young man was in so much pain. After the eye was removed, the retina and inside of the eye were found to be stained with ink. There was also cell loss on the corneal epithelium—which keeps the cornea healthy. Even if the eye had been saved, the patient would have had serious vision problems. Learn more by watching a clinical video about this case. Warning: video includes graphic surgical footage. For a safer way to change the appearance of your eyes, talk to your ophthalmologist and get a prescription for costume contact lenses. Colored contact lenses can sometimes be found online or even in costume shops. But don’t use any contacts unless they’ve been prescribed and fitted by a doctor. It’s illegal to sell contacts in the United States without a prescription. Contaminated or ill-fitting lenses can cause blinding eye problems.